Pauline Innes (OPRED), at the Offshore Decommissioning Conference. Nearly £1 billion worth of security has been squirreled away to protect UK taxpayers from being slapped with excessive decommissioning bills, a UK Government official said. 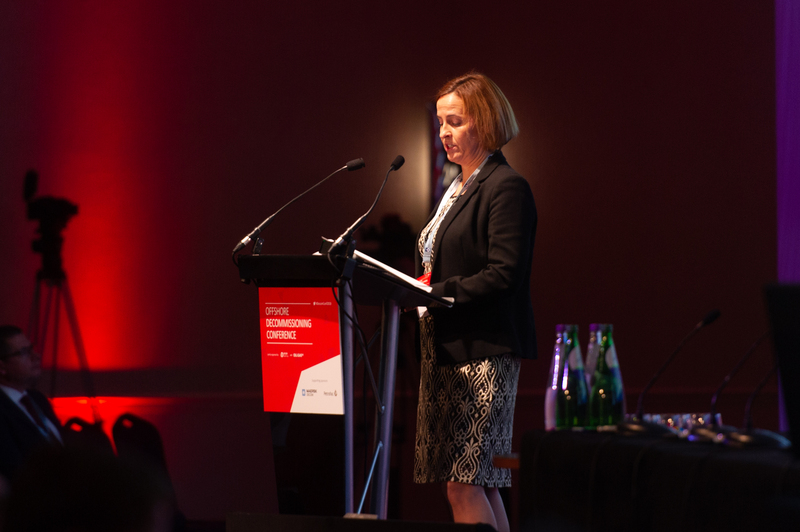 The government has been making increasing use of its powers to reduce risk as more fields change hands or finish production, said Pauline Innes, from the Offshore Petroleum Regulator for Environment and Decommissioning (Opred). Opred sits within the UK Department for Business, Energy and Industrial Strategy and is responsible for approving decommissioning programmes. Ms Innes said it was her regulatory role to “protect taxpayers from paying the full cost of decommissioning” and prevent operators from “walking away” from their liability. In June 2017, the Oil and Gas Authority (OGA) revealed it would cost £59.7 billion to dismantle the UK North Sea and set the goal of reducing the figure by at least 35%. This year, the OGA said the total has dropped to £55.7bn on a like-for-like basis and praised companies for rising to the challenge. The UK tax payer is expected to have to foot a sizeable chunk of the bill due to the availability of decommissioning tax relief. Oil companies build up credits on the taxes they pay during the production life of a field. They can then use those credits to offset decommissioning costs once the well runs dry. Energy consultancy Wood Mackenzie has estimated that UK taxpayers will ultimately have to fork out £25bn. Speaking at the Offshore Decommissioning Conference in St Andrews, Ms Innes said Opred expected operators to pay for decommissioning. She said: “We know the taxpayer will pay for a proportion of decommissioning costs, but we don’t expect it to go beyond that, so financial planning is critical. “All operators should have adequate financial plans in place to meet their decommissioning liabilities. “I don’t think it will surprise many to know that government has a low risk appetite in this space. Ms Innes said Opred was looking for operators of mature fields to provide assurances that they have financial plans in place. She said the organisation had two risk mitigation options which can be wielded if it is not satisfied. The government can issue a section 29 notice requiring the field operator to submit a decommissioning programme. And it can request that operators enter into a “decommissioning security agreement” and stump up security to cover the post-tax cost of decommissioning. Ms Innes added: “We have been making good use of these powers. At the moment we have around £850m of security in place and that’s a figure we expect will increase. “Our discussions not only focus on mature fields, but also fields at the other end of the life cycle. “If a new field is being approved involving a single company and that company does not have a sufficiently robust financial history or funding structure we may request financial security. “We know it’s important to taxpayers that we watch the money closely. “It is also important for investors to know we take funding of decommissioning seriously and won’t let companies walk away from that liability.